Stock your ice cream shop with Fox's walnut ice cream topping. This walnut syrup is a quick and easy way to enhance the look, texture, and flavor of just about any dessert, and it contains no trans fat. For supreme taste and perfectly sweet flavor, trust Fox's ice cream toppings, like this walnut topping, for your sweet treats! Each half gallon-sized container holds about 65 servings of walnut topping, so your ice cream parlor, bakery, or restaurant is sure to be in good supply. "These walnuts are absolutely perfect! They make the perfect topping to an old fashioned banana split! The packaging is also wonderful. I have never had any spills or messes during the transport due to perfect packaging choices!" Use this nutty topping made from crushed pieces of walnuts drenched in a sweet syrup to create fantastically-flavored ice cream sundaes. Pile it on brownies for crunchy texture and extra sweet taste. Or, scoop some onto cheesecake, funnel cakes, pancakes, waffles, and more! 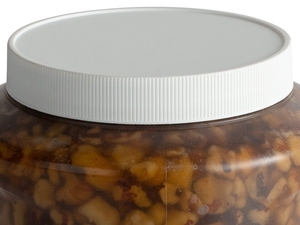 The resealable lid helps maintain product freshness, while also extending shelf life. No matter what dessert you are serving, add in this walnut topping or use it as a garnish to add a sweet, nutty taste and crunch that is guaranteed to satisfy your customers. With over one hundred years of manufacturing toppings and flavored syrups, this Brooklyn-based company's tried and true formula for walnut topping is sure to please. Be a part of Fox's long-standing tradition of producing great-tasting ice cream toppings, and stock your ice cream shop with Fox's walnut topping! Item #: 113WNPCRW25 Patterson Nut Company Walnut Halves and Pieces, Raw - 25 lb. Dutch Treat Ground Peanut Butter Cup Topping - 10 lb. Chopped SNICKERS® Bar Ice Cream Topping - 10 lb. Rainbow Nerds® Candy Ice Cream Topping - 10 lb. Chopped Cookies and Creme Ice Cream Topping - 10 lb. Chopped M&M'S® Ice Cream Topping - 10 lb. WE have been open a month now and are very satisfied with the compliments on our sundaes and banana splits. The topping has a good bit of fruit in the fruit toppings and creamy on butter scotch and carmel. 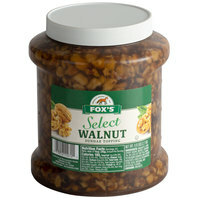 Foxs walnut topping is delicious, great price, great consistency, always fresh tasting. You can use alone or you can add ingredients to it as you wish! I was in the mood to make Italian peach cookies and I was out of walnuts. I figured I would give these a try and I was pleasantly surprised at how well they worked when I mixed them with my other ingredients for the filling. They actually tasted better! Delicious ice cream topping at a much cheaper price than most other sources. Great for Sundae Bars or desserts for the home or business. One of our top sellers. 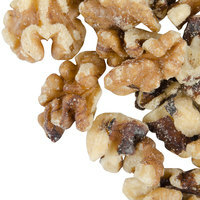 A very fresh and great tasting walnut topping that is great for topping sundaes and other desserts. 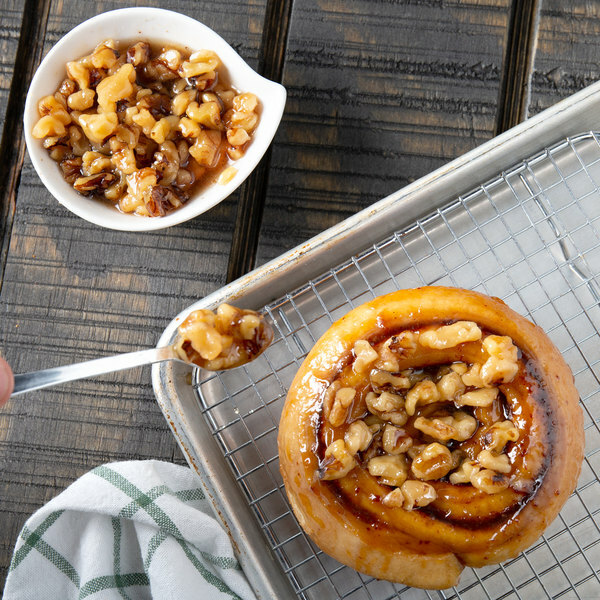 We love topping our brownies with this walnut glaze. Please do not let the price of this walnut ice cream topping turn you away. This is actually a great price and it will pay for itself quickly when priced accordingly in your ice cream stores. The Fox's walnut ice cream topping is great and fresh. The topping makes a nice glaze for our pound cakes and love the great texture and taste. Any place serving ice cream sundaes or banana splits should have these on hand. They are definitely delicious! We recommend and will buy again and again! The absolute best! It comes out extremely easy and taste like they were just made. A great addition to any ice cream or pie dessert! Very crunchy and syrupy, I've ordered few times, the price is good when compared with other companies. Full of walnuts and it doesn't try up. Was not exactly what I wanted but I decided to keep it and use it as a topping for cheesecake or one of my other baked goods. These walnuts are absolutely perfect! They make the perfect topping to an old fashioned banana split! The packaging is also wonderful. I have never had any spills or messes during the transport due to perfect packaging choices! Not only is there a wide variety of Fox toppings, but they are all fantastic! We go through containers of walnuts daily and it is relieving to know the quality of walnuts we get through Fox's and that the price cant be beat! The fox brand is delicious. You can't go wrong with any of their toppings. Everyone tells us we have the best sundaes around! The Walnuts are great! These are without a doubt the best wet walnuts on the market. Our customers love them, and so do we. The price is reasonable and the product outstanding. Excellent product, customers really like it. Were not sure how it would sell but it is a very popular topping. Definitely get for your shop! Wet walnuts are our most popular ice cream sundae flavor! A favorite of all ages, these wet walnuts taste great and are reasonably priced. This is my husbands favorite topping. My brother sent us some and we love it and order it for ourselves now. Living in Iowa it's hard to find wet walnuts. Simply the best topping for ice cream. You can't beat wet walnuts. 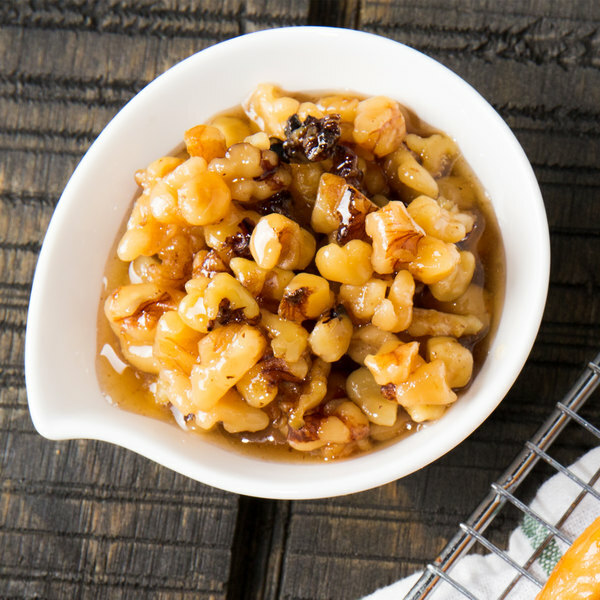 Nice crunchy walnuts in a sweet syrup. Very hard to find locally so glad I can get it from Webstaurant. Great Product is wonderful on an ice cream sundae Much cheaper to buy it this way rather than the little bottles we can get locally. Mmm, mmm, mmm! This walnut topping is just perfect for any ice cream sundae, but I also use it to top my rich and creamy Walnut Cheesecake. My mom recently became allergic to peanuts so this Walnut ice cream topping is perfect to keep in the house. It's gooey and delicious, she loves that they come chopped up. The Fox's walnut ice cream topping is a great product for ice cream and other desserts. It is thick and sweet and overall a great treat. Creamy, tasty, and thick. This topping is great, with great quality, great flavor, great shelf life and a great price, all around a great buy. I tried the walnut topping at an ice cream store and I LOVED it. When we started baking walnut cookies, we tried using this walnut ice cream topping and it made the cookie taste amazing! The cookies were gooey and very soft because of the walnut juice that is in the container. I use this for sundae topping and also for milkshakes. It is great for either. It has a very rich taste and u dont have to use alot. Your ice cream toppings are very popular with my customers. They especially like the walnut topping. It is always the first topping that we run out of.